As soldiers return home from the First World War, a rural Saskatchewan town is exposed to a threat that is perhaps as terrifying and deadly as those encountered on the battlefield—the Spanish Flu. 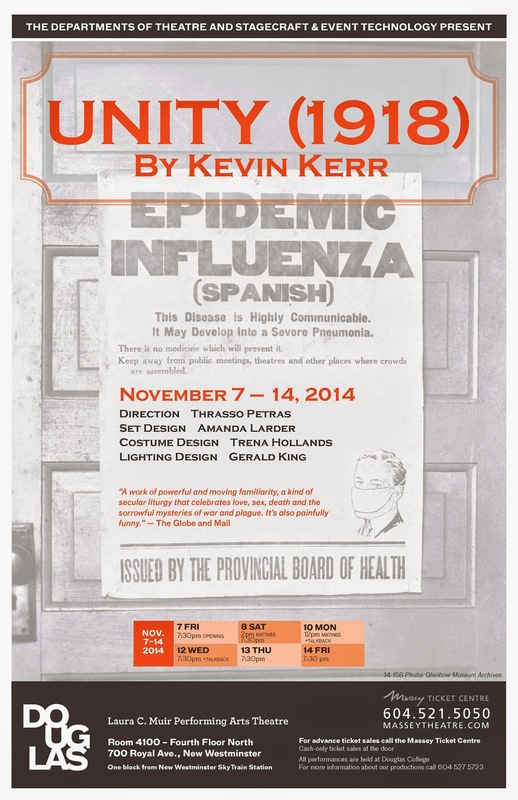 The Douglas College departments of Theatre, and Stagecraft and Event Technology present Unity (1918) November 7-14. Written by B.C. playwright Kevin Kerr, the Governor General’s award-wining play focuses on Beatrice, a young woman from a farming family who narrates the tale through her diary. As the town of Unity takes increasingly drastic steps to control the virus, Beatrice and fellow residents also struggle with the feelings of fear, paranoia and loss that are spreading through their lives. Unity (1918) runs November 7-14 at the Laura C. Muir Performing Arts Theatre, Douglas College, 700 Royal Ave., New Westminster. Tickets ($8-$12) are available through Massey Theatre, 604 521 5050.